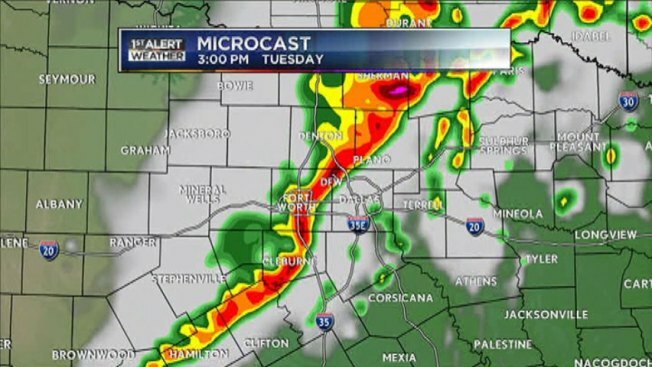 Microcast Loop 2 p.m. - 11 p.m.
Several North Texas school districts are dismissing early Tuesday or canceling afternoon events due to the threat of severe weather. With the threat of severe weather forecasted Tuesday in North Texas, districts began taking a cautionary approach by dismissing early. At about 10:45 a.m. Tuesday at Cleburne's Gerard Elementary, several students boarded buses for early dismissal. Alvarado said, in a tweet, that they will be releasing students at noon and that a normal bus schedule will begin at that time. Early in the afternoon, officials with the Arlington, Grand Prairie and Dallas school districts canceled after-school events. See a complete list of early dismissals and closings here (though not all districts are posting after school event statuses to this system).